Okay, have you picked out a favorite? Seriously, how can you not? My favorite is the violin. 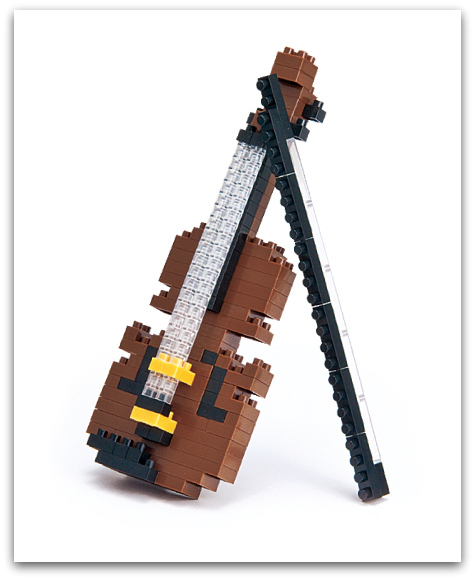 I think the violin one best showcases the unique abilities of Nanoblock, an educational toy that has taught me much over the past year. If you don't own them, then at least you've seen them around, right? They are so teeny tiny that can't help but spark your interest but maybe you haven't purchased one yet because they look difficult? too small? there is no Ninja warrior spinning on top of it? I have to admit, I was curious about them but hadn't made any Nanoblock purchases until Christmas of last year. I bought a parakeet and a penguin. Look how small they are!!! I showed them to my almost eight-year old builder boy (Number 1 Son) who promptly said, "Whoa!" and opened the package to start building a parakeet. But guess what? After five minutes, he gave up. WHAT????? This is not like him. He loves to build! How can this be? Get back here! Build some neural pathways dammit! These two birds cost me $20 bucks (okay, somewhat less because of the holiday sale). But alas, he said something about it being too complicated and he went on his merry way. I didn't quite understand what had happened. Sure he is not yet 8 but I know my son could handle it. Why wasn't he building this bird? Several months later, I think I've figured out why. First, I gave it to him just when I started Toys are Tools. (It's almost a whole year, people!) There was so many bleeping, lighting, snapping, whipping, wowwing things in our home, that this tiny little bird could not compete! The second reason was my choice of what to build. My son likes building inanimate objects. Lots of boys do but I gave him a bird with pastel colors because I liked it. You see where I'm going with this? This is 150 pieces of the Black Guitar. 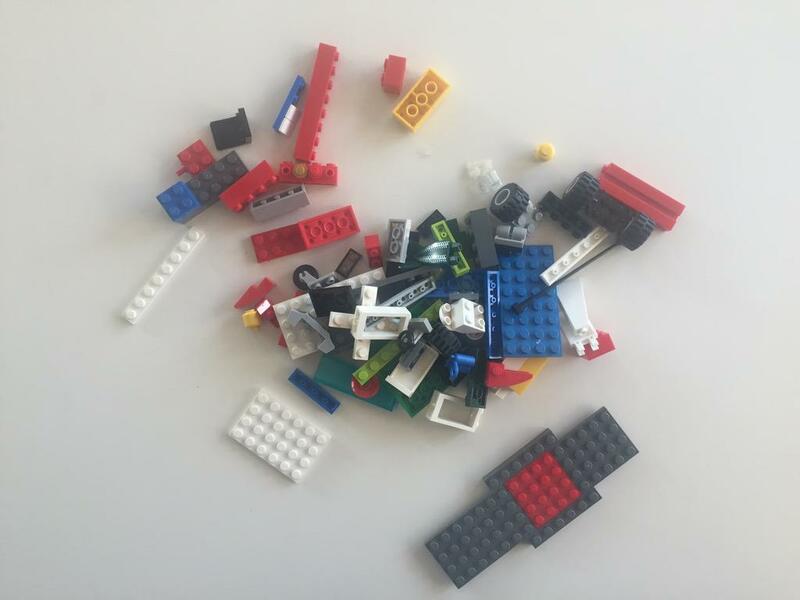 Look how much space the pieces take up! 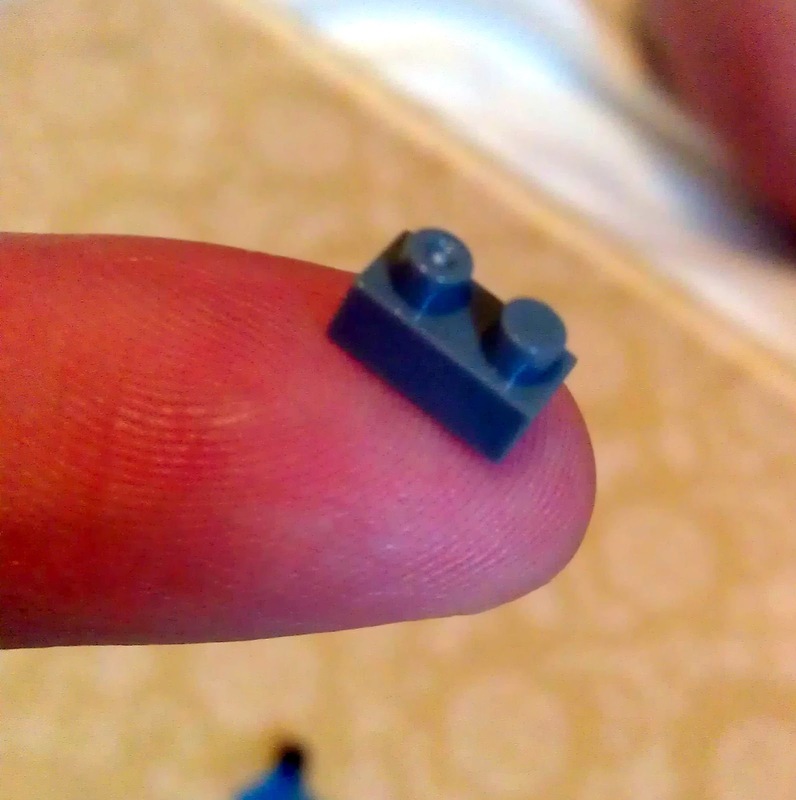 I am telling you this story not to dissuade you from Nanoblock. Rather, I am giving you the long version because I really really like them and if you choose them, I think I have a couple of tips that may help you make a good choice for your family. This must be a satisfying view for the builder. Hooray for hand/finger-eye coordination skills! The complexity is enormous compared to its very small size. What Was Your First Nanoblock Kiss? 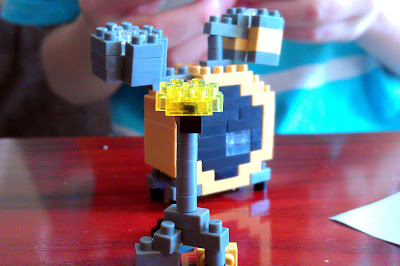 Half a year passed after the initial Nanoblock rejection. Then, a couple of months ago, I showed him the new musical instruments that came out this year! By then, he was 8.5 years old and he was hooked! He also loves guitars! He spread out the pieces and he was determined not to stop until he was finished. 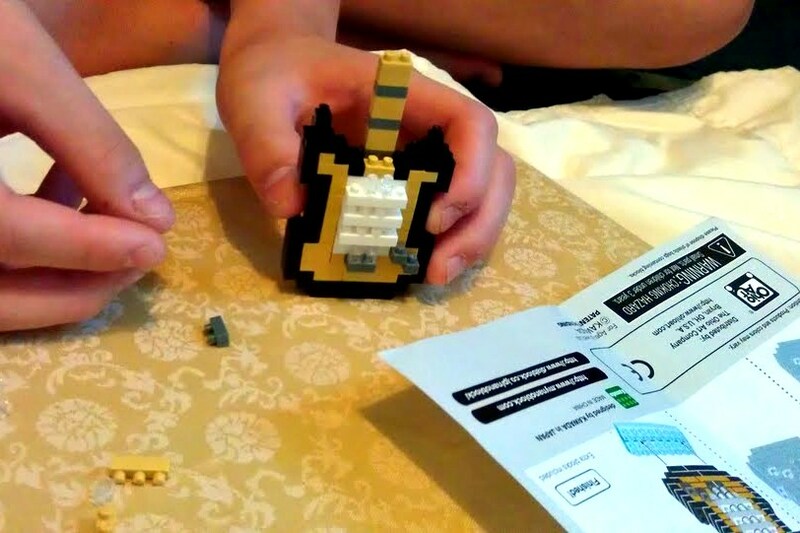 His first Nanoblock project was the Black Guitar and it contained over 150 pieces in the wee little package. This time, he salivated over the guitar and didn't find it daunting at all. 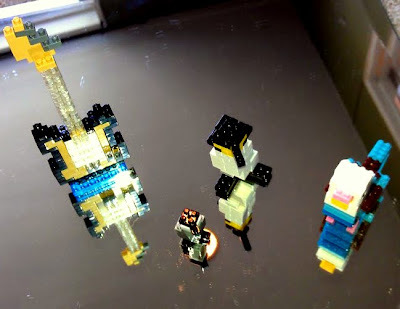 It took almost an hour to finish but he did and he was itching for more but the only Nanoblock package I had left at the time was the unopened penguin dating back from the last holiday season when he walked away from the parakeet. He opened the penguin package and after five minutes, he put it away! He was done. The guitar had given him enough mental workout for the day. I could tell he was pooped and I was really happy to see it!! Just like the way you know you did something good at the gym even though you can barely walk. He challenged himself "just enough" and he walked away content with his work. 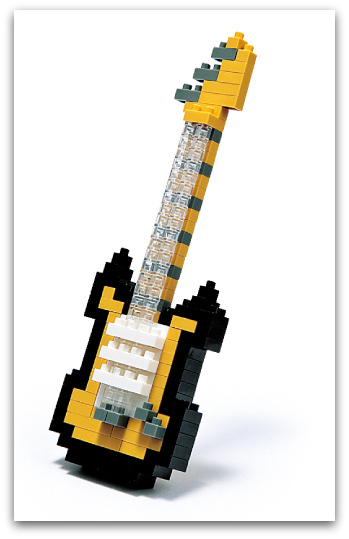 I think in Japan, where Nanoblock originates, there are loose blocks being sold in stores. However in this country, it looks like they only come in sets. That is okay with me for now. I think you have to be a little more mature and more skilled than an average eight year old to create representational art with Nanoblock. However, the things that they can build are really beautiful and it's the kind of beautiful that you can leave in your cubby at work or rest gloriously on a shelf in your living room. Wouldn't you prefer to put that up instead of the things you throw out at night after they've gone to sleep? Birds + Music. The new 2012 Black Guitar by Nanoblocks with birds from last year's run to the toy store. Those clear blocks made a very good impression on my boy. 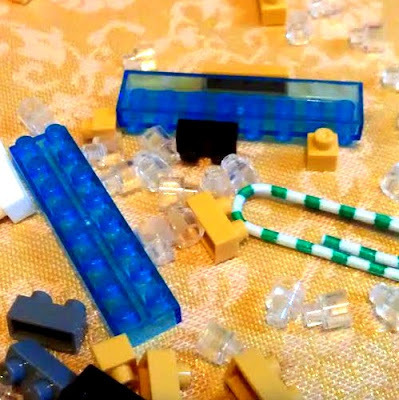 Even though the Nanoblocks do not take up a lot of space, the more space you give them, the better it looks. 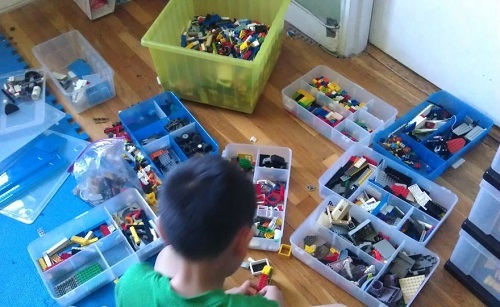 If your child really loves what he built, then the area around the Nanoblock will be free of clutter and that will make all of you happy. I have a friend whose son is able to build complicated Lego structures (kits for ages 12+) but then he will NOT play with them. He just builds it and lets them sit on a shelf and he just likes to look at them. This would bother me after a while because art is great but your space to play should not be a half-museum and half-play space. If he could not take apart anything that he built then the least it can do is be small for him. Despite its size, the beauty of Nanoblock is a complex one and just as extravagant if not more extravagant-looking than the larger-size building block toys with equal number of pieces. This was once the violin. Look at all the pieces. Step 1- Number 5 starts the violin. So simple and yet so not simple! Kudos to Number 5 who came back to finish the bow. Oh yes! I was very eager to give it to Numbers 5 and 6. Mainly, because I think they are soooo beautiful and Numbers 5 and 6 were given the piano and violin because those are the instruments they play! The oldest of the two who is 9-years-old received the violin (No. 5). The violin is supposed to be the easiest (Level 1) and this young lady has built Lego Harry Potter toys in the past. 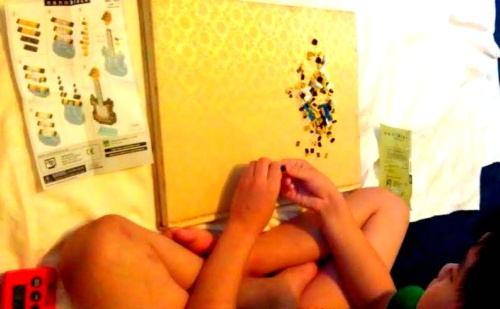 However, she became a bit frustrated in the middle of building it. Apparently, she had made a mistake and fixing it required going back several steps and rebuilding. It was too much and she walked away. However, she was able to come around and finish the bow. I'm glad she did. She made a beautiful bow. Kudos to her mom for helping her finish on a good note!!!! Despite the less than optimal success, I have a feeling that if we wait a while, she may warm up to them again. 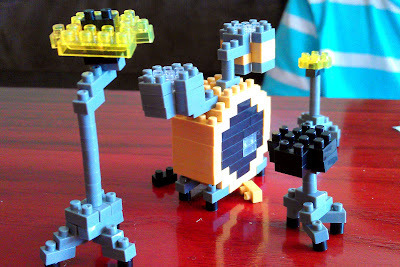 I also should opt to present her with an animal Nanoblock. She loves drawing animals and people. Even though she is a violin player, I can see her having much more fun building horses or frogs. Subject material matters. Number 6 is not a Lego kid and yet she enjoyed building her Nanoblock piano. I can see why this took two days. Number 6's mom was quite proud of her daughter. 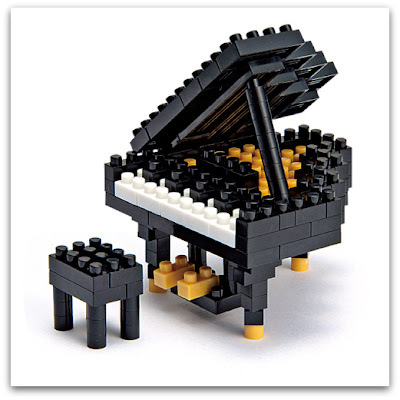 The other young lady, Number 6, doesn't own a single Lego piece and actually finds building toys a bit daunting however, she does play the piano and had a great time building the piano Nanoblock. She paced herself- working on it over a period of two days and just as I suspected, the piano takes up some living room shelf space to show its little self off. 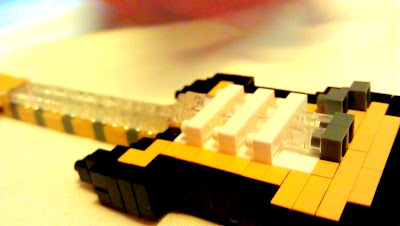 I think as we build more with Nanoblock, we'll start getting used to more open-ended possibilities. Do you see anything here within this half-built drum set? I think I see Wall-E. I can tell that their minds are working hard from the fatigue or even frustration that they may feel. It's all good as long as we don't push. It's really worth it to give this a try. When they are done, they can marvel how something so tiny can be so difficult and yet bring so much joy. .... kind of like the way we looked at them when they were unable to hold up their own heads. 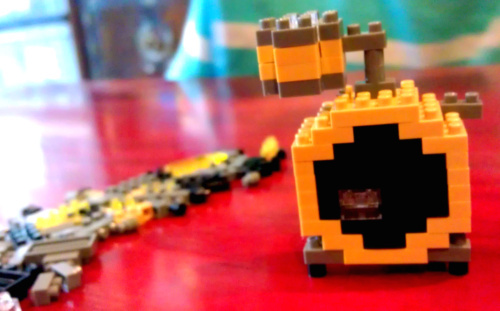 Like babies, Nanoblock is another great example that good things come in small packages. P.S. Holiday Gift Idea- Get a collection of your child's favorite musical instruments as a holiday gift. Buying one to try out is a good idea but if you are really interested and invested, a set of three or more can be quite delightful, possibly a welcome retreat from the ruckus of the holidays. 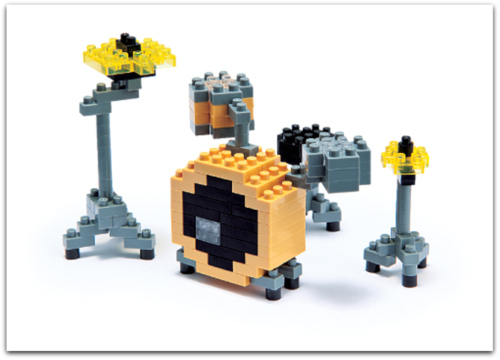 Now you can win your own set of these four GORGEOUS Nanoblock instruments- Only one winner for this huge prize! Try the Rafflecopter widget below and remember... please follow the rules... If you are supposed to make a comment on the blog post, the rule of thumb is... if you can't see your comment and you have entry points for the comment then, it doesn't count! Also, if you have trouble entering Rafflecopter via Facebook, try just using your email address. I'm sorry this system frustrates some of us. If you have trouble email me. I want to help. This giveaway will only be shipped to U.S. addresses and ends on Nov. 13, 2012. Can't wait to see if you've won? If you are going to purchase it someday, put it in your shopping cart thru my Amazon links below and support Toys are Tools! I like the violin the best; my son liked the piano. 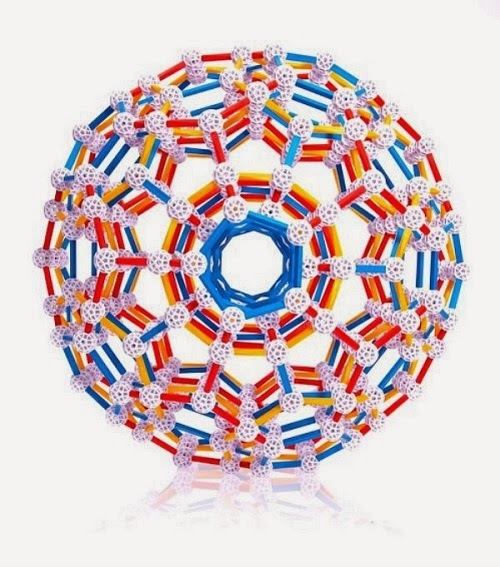 I think the insect nanoblocks look awesome! Sarah, where do you see insects? Are you sure you went to www.mynanoblock.com? And the violin is my favorite too! My favorite is the guitar and my son's favorite is also the guitar. I think the space shuttle looks amazing. Is that harder than the Empire State Building? 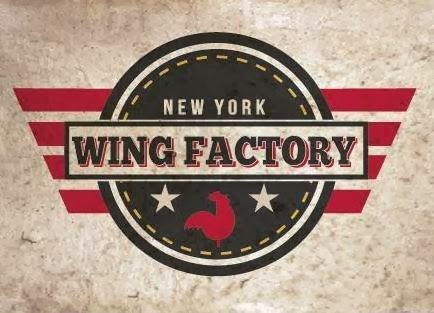 It seems like it is a nice gift idea to someone coming to visit us in New York from out of town. Much better than buying a t-shirt or souvenir. i love the piano. my toddler loves all instruments at this point. the beetle looks very cool! nano-insects! I like the piano. I think my kids would like either the piano or guitar the best. The buildings looks really cool. I especially like Sagrada Familia and Neuschwanstein. They look complicated but interesting. I have also been there so it would be a way to talk about world places with the kids and possibly drag out some old photos. I love my electric guitar. My kids love the piano. I love step2 houses and playgrounds. I also like the nano Synthesizer. my favorite is the piano, and of course my kid loves the guitar! The stonehenge set is great! Educational and fun too! I played the violin whenI was younger. My boys like the guitar and drums the best. With the weather getting colder I like the Snowman. My favorite instrument is the piano. My son would probably like the guitar the most. We have the Nanoblocks space shuttle. It's beautiful when it's completed. 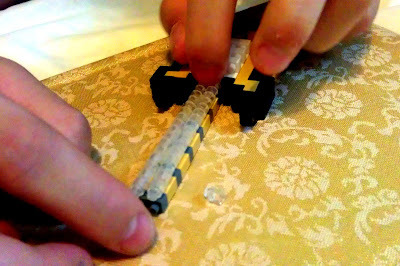 I would like to see a review of Paper Roller Coasters, but I'm biased in that respect. 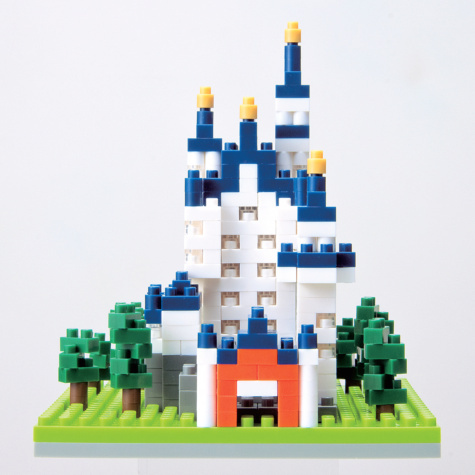 On the Nanoblocks website, I liked the "Neuschwanstein Deluxe" model. 5800+ pieces! Wow! After using Lego as a connection tool with my stepdaughters, they moved on to tweener girl things and I moved on to Nanoblock. I've gone nuts in the past year, buying most of the American releases and several of the Japanese releases. My favorite build was the red guitar (Japan only, but looks the same as the black) and Mont St Michel, a beautiful French monastery. I recently completed the new US landmarks - Empire State Bldg, White House & Statue of Liberty. The White House is 900+ pieces and the largest I've done so far. Empire State is not too challenging, while Lady Liberty is. There are even fan sites on Facebook which provide custom build instructions where you combine two sets. For instance - two violins can make one viola, and two grand pianos can make one upright piano. I've also learned a little Japanese while collecting, as well as facts about some cultural "Sites to See" around the world. I can't praise Nanoblock enough, they're wonderful. the paper roller coasters looked really cool. I love all the cutting challenges involved! please go to my product submissions page if you are interested in sending a submission. And... I saw the Neuschwanstein Deluxe too. that looks crazy. I am always curious as to who designed these toys. It must have taken them such a long time to create it. Hooray for all the toy inventors! I love guitar, my daughter likes drums. You should review the Nanoblock Neuschwanstein!